In February 2015, a new strategic trilateral dialogue was held between Pakistan and Afghanistan under Chinese coordination, illustrating Beijing’s recent commitment to support Kabul in pacifying its country. Afghan President Ashraf Ghani, elected in mid-2014, has been reaffirming his willingness to set the wheels of negotiations in motion. It implies engaging in negotiations with Pakistan to resolve the problem of Pakistan’s support for the Taliban, across the Durand Line. While the dialogue is still new, China appears to be brokering these discussions. That Beijing is evidently involving itself – in shaping the future of Afghanistan and Pakistan – more than ever underscores a considerable shift in the way China deals with its neighbourhood. Since 2001, China had been limiting its intervention to minimal security contribution; but over the past two years, a proactive tone has been used vis-à-vis improving bilateral ties with Afghanistan and the commitment of an increased Chinese economic footprint in the region. What are Chinese Interests in this Region? First, China is extremely concerned for its national security, particularly due to the spread of terrorism and terrorist ideology into the Xinjiang Uighur Autonomous Region. The Uyghur separatist movement is a national security matter with important external connections. China already has some counter terrorism measures in place that it implements inside its borders. Tackling terrorism, especially the Taliban, across the Chinese border to ensure that Afghanistan does not become a strong base for Uyghur militancy complements the effort. China also feels the need to secure a stable environment around its oil and gas pipelines,trade routes with the Gulf countries as well as all its other economic interests. China’s energy needs are constantly increasing, and Beijing cannot afford to let territories its pipeline networks run through to fall prey to terrorism and instability. The success of Beijing’s New Silk Route too depends heavily on the stability of the region. The Chinese involvement in the resolution of the Afghan conflict also responds to a global plan of empowerment at the international level. According to China, its involvement in Afghanistan is part of its ‘Peaceful Development’ plan that focuses on stabilizing and securing its neighborhood. Afghanistan was the missing piece of the Chinese regional diplomacy and ensuring stability in this country would have a beneficial effect on the neighborhood. For Beijing, securing a peaceful neighborhood is sine qua non if it wants to meet its aspiration of becoming a global superpower. What makes China a particularly interesting ally for Afghanistan is its position between the three main parties involved in the conflict, justifying the Afghan president’s choice to make Beijing the destination of his first official visit. On one hand, China has had a long-term partnership with Pakistan that could be helpful for Kabul to pressurize Pakistan into taking coordinated measures to get rid of the safe havens Taliban find in the country. Despite the détente between Afghanistan and Pakistan since Ghani’s election, drawing a more suitable backdrop for cooperation than in the last decade, Pakistan does not allow fair negotiations. China actually has the power to influence the negotiations by taking on a mediator role. Beijing can do so because it has several economic and non-economic counter-arguments to deter Pakistan from refusing to cooperate. Given the introduction of the China-Pakistan Economic Corridor project – for which China is mobilizing $46 billion (approximately 20 per cent of Pakistan’s GDP)–Pakistan will be heavily economically dependent on Beijing. 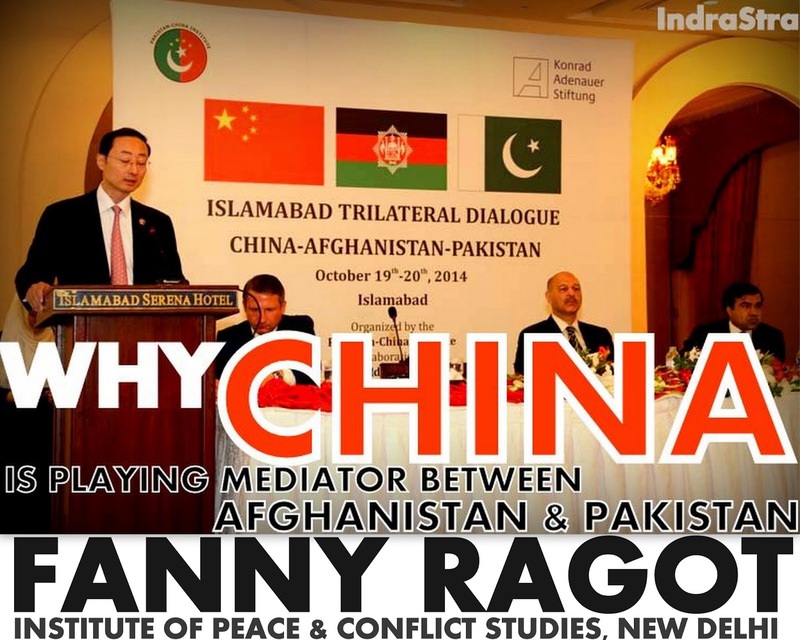 Besides, taking actions against terrorism in Pakistan is a way for China to fix Pakistan’s lack of attention vis-à-vis Chinese security interests, and to give Islamabad the means to flush out the insurgents; and which would benefit both Kabul and Beijing. China’s links with the Taliban, which were low key before and after 2001 appear to be becoming more and more indiscreet. In November 2014, a Taliban delegation was sent to China and even though the entire contents of the discussions are still unclear,the very move of not interacting via intermediaries anymore gives China a proper space to open dialogue with them. Overall, China benefits from strategic partnerships in its favor with Pakistan as well as the Taliban, which turn out to be of great interest not only for Kabul but also for the whole Chinese project of stabilising the region. By responding positively to Ghani’s demand of mediating the peace talks, China attested its willingness to protect its interests. Beijing’s involvement in the Afghan peace process will be a veritable test for its new foreign policy orientation as well as its diplomatic capability, especially since the US failed to durably stabilize the region. With China taking the lead in the discussions between Afghanistan, Pakistan and the Taliban, India feels isolated owing to the sense that it has been relegated to a supporting role. However, India is unlikely to be sidelined in Afghanistan. New Delhi is still an important strategic partner for Kabul, and the future of their bilateral relations depends on how India manages to balance and maintain its ties with Kabul. This article was first published at Institute of Peace and Conflict Studies, New Delhi on 3rd June 2015.